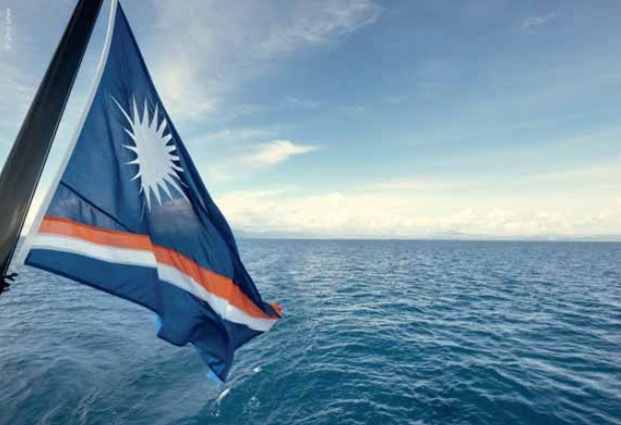 The Republic of the Marshall Islands (RMI) Registry is the third largest registry in the world, standing at more than 117 million gross tonnes (GT) and over 3,395 vessels at the end of January 2015. International Registries, Inc. and its affiliates (IRI) provide administrative and technical support to the RMI Maritime and Corporate Registries. Irrespective of the growing challenges faced by the maritime industry, the RMI Registry has had a particularly successful year, having grown by over 320 vessels and 16 million GT, which is a 17% increase in GT from the previous year. The largest group, bulk carriers, represents 29% of the RMI fleet in terms of number, and 36% by GT. The RMI Registry’s success in enhancing its fleet and reputation in 2014 is largely attributed to its Greek clients, as the largest percentage of the RMI Registry’s fleet derives from the Greek shipping community. Nearly 40% of bulk carriers in the RMI fleet are Greek owned, and a recent paper published by the Greek Shipping Cooperation Committee (GSCC) notes the RMI Registry is reaching the top position in the Greek market, gaining more than 43% of the gross tonnage and nearly 55% of the total number of vessels gained overall. team worldwide, IRI ensures a high level of service and continuous improvement to the decentralization of registry related services for the increasing number of RMI flagged vessels. IRI’s global staff is available to respond to inquiries regarding RMI maritime and corporate matters on a 24-hour basis. IRI strives to ensure consistency among its network of 26 worldwide offices in terms of registration and ongoing technical and operational support, and aims to simplify procedures so that documentation is processed swiftly. The RMI has received the highest ratings in port State control (PSC) international rankings. The RMI is the only major open registry to be included on the White Lists of both the Paris and Tokyo Memorandums of Understanding (MoUs) and has maintained Qualship 21 status with the US Coast Guard for ten consecutive years, which is unprecedented. Such achievements are attributed to the RMI Registry’s thorough pre-registration vetting and assessment process for ships entering and remaining in the RMI. The pre-registration screening process for every vessel and operator, and the point score system for fleet assessment, is monitored closely by marine safety and technical personnel, enabling the RMI Registry to maintain these high rankings. Managing the considerable growth of the RMI fleet while maintaining quality service is key to the RMI Registry’s reputation as a first class registry. A major challenge faced by the maritime industry is the increasingly stringent international regulatory environment. The RMI is a signatory to and enforces all major conventions and their related codes. The primary responsibility of the RMI Registry’s Technical Department is to oversee the implementation of the applicable national maritime laws and to ensure that the International Maritime Organization (IMO) codes and conventions are carried out to the fullest extent practicable on vessels in the RMI fleet. With an assigned permanent representative and active delegation at the IMO, the RMI plays a significant role in shaping future regulations, allowing the RMI to proactively manage the implementation of new requirements by owners and operators of RMI flagged vessels. IRI continuously monitors the current economic, regulatory, and technological environment to ensure that the RMI Registry is properly and adequately resourced worldwide. This allows the RMI Registry to stay in close contact with owners and operators and maintain first class service.